Lietošana Izlasiet un sekojiet lietošanas instrukcijai. To complement the innovative colour system, Schwarzkopf has developed two care products infused with OMEGAPLEX Professional Anti-Breakage Technology. Both the Conditioner and Treatment are available to buy separately and can be used with all brands of hair colour. Color Expert's OMEGAPLEX professional Anti-Breakage Technology was developed especially to protect and reinforce the hair during and after colouring. It's 3-step system strengthens the outer and inner hair structure for a revolutionary result. 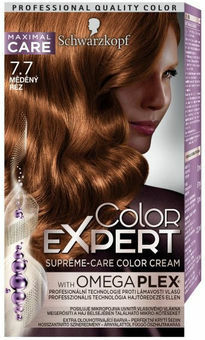 Color Expert smooths the outer hair surface for up to 90% less hair breakage. So worries about the health of your hair during regular colouring is a thing of the past.